With its clean lines and minimalist finish, the Brushed Steel Breakfast Bar Stool Cream is a wonderfully versatile piece of furniture. 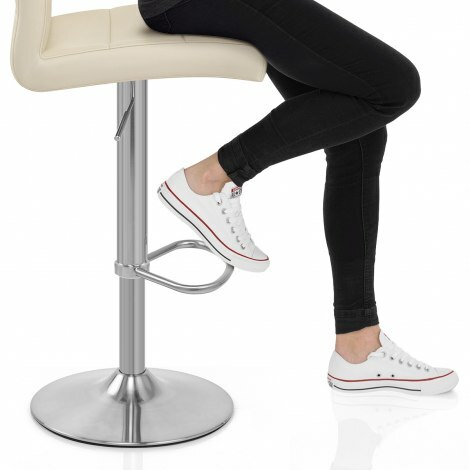 A real modern piece of art for the bar area, the Breakfast Bar Stool has simple yet successful design features that certainly impress. Upholstered in contemporary cream faux leather with horizontal stitch detailing, the seat is ergonomically designed for optimum comfort. 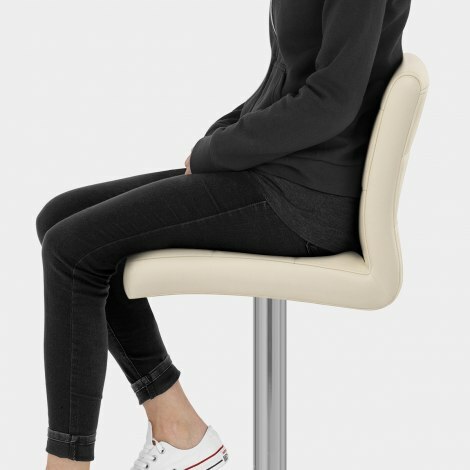 For extra support, both the seat and the backrest are filled with high-density foam. The brushed steel column has an incorporated gas-lift mechanism, allowing you to adjust the height of this model and rotate through 360-degrees. Plus, a handy triangular footrest is also included. This rests on a classic rounded base with a similar brushed finish, complete with a rubberised underside to help to prevent damage to your floors, making this model ideal for any surface type. "They look amazing. Very comfortable"
Very happy, great service. Lovely product. Easily assembled. Seat cover is made of good quality leather and the chair feels stable even at full elevation. Feel the price is fair for the workmanship and quality standard. Really happy: an excellent product! Very pleased with the new cream bar stools. Speedy delivery and easy to assemble. Perfect match for my kitchen cupboards. Thank you. Fast delivery, great product. Simples! Good product, does the job, looks good in our new kitchen, excellent delivery.